Great find PAN. All three of them looked really good. And isn't that the same suit? It seems to fit better in this picture than it does now. What a difference 2 years makes. I think the other suits may be too heavy , that's why the white linen and this blue one is worn, he would probably burn up. I would break my neck getting in and out of that boat in flats, I give Amal credit . The daily fail knows nothing that is not a water ferry. I also think Amal has shorts on under the dress a lot of women who wear short skirts wear little boy shorts so that if caught by a breeze nothing is shown. Annemarie, you are really optimistic if you think she is wearing boy shorts with this dress. I hope you are correct...as the length seems to match the polka-dot shorts. Yep , I do believe she has shorts on the women that I know who wear short skirts wear them they don't show but they are there. The little shorts under the dress me thinks that is a great idea . In my humble opinion it is more credible that Amal under that mini dress does not lead her pants because a person going up on the boat with those sandals and with that dress just want to be seen! party animal - not! wrote: Better? Hey PAN, thanks for the find. Really nice pic of George with his family. Nina looks gorgeous in red! 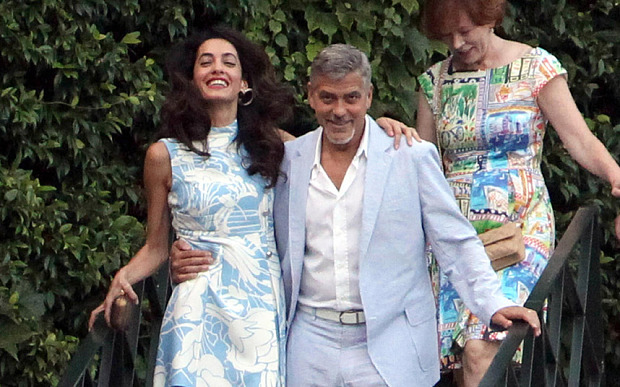 Wonder if he had met Amal by then .... July 2013. That suit looks great on G. But the front button is a dark color. Our guy's suit that he wore the other day has white buttons on the cuff ..... so if you assume that a suit has same color front and cuff buttons then not the same suit. Think this suit fit him so much better than the one he wore last week. Thanks for the recent pictures. I like their total look. I never could wear heels like that. Enjoy Amal ! While you can. Well, the guy holding the boat is getting quite the eyeful! She didn't learn from Venice? I am all for mounting a rescue mission .....If only I knew where they put him ? WWHS - I would give you a greeny for my morning giggle - but I have not earned by greeny stripes yet. That is quite the look on his face.